A somewhat technical but very important exchange took place on the Senate floor late Thursday morning, which you can file away for the next time you hear Republicans tut-tut Senate Democrats for not passing a sequestration replacement bill. Later today, the Senate will vote on whether to consider two sequestration replacement bills. Both will be set at a 60-vote threshold. One — the Democrats’ bill — would replace about a year’s worth of sequestration cuts with some better-targeted cuts to defense and agriculture and also with new revenue, largely by imposing the Buffett Rule, which imposes a minimum effective tax rate on millionaires. The GOP bill would preserve sequestration’s overall spending cap but hand authority for allocating the cuts to the Obama administration — a clever idea that also shields Republicans from blame when the cuts hit. Sen. Kelly Ayotte (R-NH) asked for a vote on her sequestration alternative — which would pay down sequestration by trimming the federal work force — on the floor this morning. Even though the agreement he reached with Republicans stipulated that the two parties would each be allowed to introduce one sequestration replacement bill, Senate Majority Leader Harry Reid (D-NV) actually said he would agree to allow them to pile on an additional bill — if they would agree to set the thresholds at 50 votes. “I would happily have three votes if the Republican leader would simply allow the votes to be held at majority thresholds,” he said. It was a clear indication that he has the votes to pass his bill, and the votes to kill GOP alternatives. Which is why Senate Minority Leader Mitch McConnell (R-KY) objected. It was a straightforward use of the minority’s filibuster powers to prevent the Senate from passing a sequestration alternative. 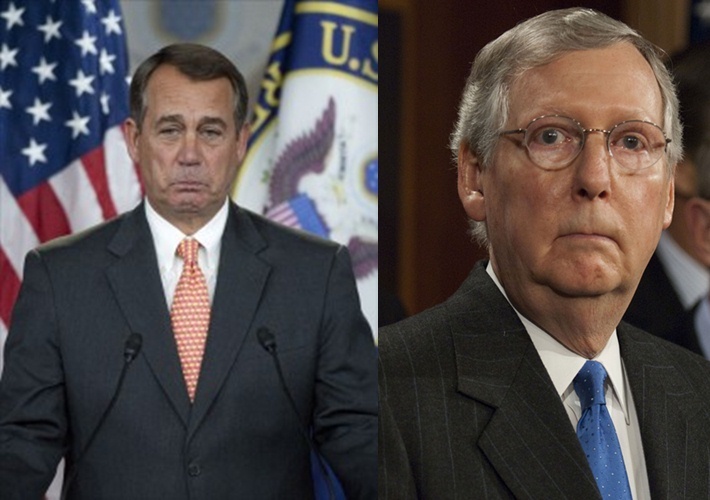 Remember that next time House Speaker John Boehner (R-OH) asserts that it’s time for the Senate to act. There is also the issue that revenue bill are supposed to originate in the House. I think that is Constitutional.